Almost every one of us is interested in watching colorful and distinct birds crossing us. But very few are passionate about studying them in detail. One such man who took extreme interest and excitement in studying birds closely and categorizing them was Dr. Salim Ali. One of the greatest biologists of all times, Salim Ali meticulously observed and documented the birds of the sub-continent for around 80 years, thereby making immense contribution to the field of ornithology. It was his phenomenal and path-breaking work in the related field that he was bestowed with the nickname of "birdman of India". Besides, he was fondly known as the "grand old man of Indian ornithology" as well. Such was his extraordinary work in the distribution and ecology of over 1000 bird species inhabiting South Asia that he created history and made significant contributions in conserving the fauna, which in an integral part of a mosaic of landscapes. Salim Moizuddin Abdul Ali, or Salim Ali as he is better known as, was born as the ninth and youngest child in a Sulaimani Bohra Muslim family. He was born in Mumbai to Moizuddin and Zeenat-un-nissa. Losing his father at the age of one and mother at three, Salim Ali and other kids were brought up by his maternal uncle, Amiruddin Tyabji, and childless aunt, Hamida Begum. He was also surrounded by another maternal uncle, Abbas Tyabji, a prominent Indian freedom fighter. He attended primary school at Zanana Bible Medical Mission Girls High School at Girgaum and was later admitted to St. Xavier's College at Mumbai. After spending a difficult first year in Xavier's College, Mumbai, Salim Ali dropped out of college and went to Tavoy, Burma to care of his family's Wolfram mining and timber business. The forests surrounding the area helped him further develop his naturalist and hunting skills. He developed good relations with J.C. Hopwood and Berthold Ribbentrop who worked with the Forest Service. On returning to India in 1917, he decided to complete his studies. Hence, he studied commercial law and accountancy from Davar's College of Commerce. He used to attend morning classes at Davar's College and go to St. Xavier's College to attend zoology classes to complete his course in zoology. Apart from his interest in birds, Salim Ali was also fascinated by motorcycles and hence, owned his first motorcycle, 3.5 HP NSU while he was in Tavoy. He later went on to possess Sunbeam, Harley-Davidson (three models), Douglas, Scott, New Hudson, and Zenith, amongst other models. He went further to get his Sunbeam shipped to Europe on being invited to the 1950 Ornithological Congress at Uppsala, Sweden. While touring France, he even injured himself in a minor accident and cobbled several times in Germany. He was rumored to have ridden on his bike all the way from India, when he finally reached Uppsala. Coming back to his interest in ornithology, he was rejected a position at the Zoological Survey of India due to lack of a formal university degree. With this, he began studying further when he was hired as a guide lecturer in the newly opened natural history section at Prince of Wales Museum in Mumbai in 1926 with a salary of Rs. 350 per month. After studying ornithology in Germany, Salim Ali returned to India in 1930 and started looking for a job. However, to his surprise, the position of a guide lecturer had been dropped off from universities due to lack of duns. Left with no option, Salim Ali, along with wife Tehmina, moved to Kihim, a coastal village near Mumbai. This place gave him another opportunity to observe and study birds very closely, including their mating system. He then spent a few months in Kotagiri on being invited by K.M. Anantan, a retied army officer who served in Mesopotamia during World War I. He also met Mrs. Kinloch and her son-in-law R.C. Morris, who lived in the Biligirirangan Hills. Gradually, on traveling places, Salim Ali got an opportunity to conduct systematic bird surveys in the princely states of Hyderabad, Cochin, Travancore, Gwalior, Indore, and Bhopal. He was financially supported by Hugh Whistler who had previously conducted surveys in various parts of India. Although Whistler initially resented Salim Ali for finding faults and inaccuracies in the early literature, he later re-examined his specimens and accepted his mistakes. With this, began a close friendly relationship between Ali and Whistler. He introduced Ali to Richard Meinertzhagen and the two went on an expedition to Afghanistan. Initially, Meinertzhagen was also critical of Ali's views but later, the two became close friends. 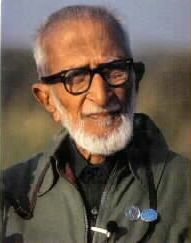 Salim Ali was more attracted towards studying birds in the field rather than getting into the details of bird systematics and taxonomy. However, he did show some interest in bird photography with the help of his friend Loke Wan Tho, a wealthy businessman from Singapore. Ali and Loke were introduced by JTM Gibson, a member at BNHS and Lieutenant Commander of Royal Indian Navy, who had also taught English to Loke in Switzerland. Hence, Loke provided financial support to both Ali and BNHS. Ali talked about the history and importance of bird study in India in Sunder Lal Hora memorial lecture in 1971 and again in Azad memorial lecture in 1978. Salim Ali was not only passionate about studying birds in general; he also showed equal interest in capturing his views on them in words. With the help of his wife Tehmina, a learned scholar from England, Ali improved his English prose. Thus, began Ali's writing career, particularly journal articles for Journal of the Bombay Natural History Society. One of his most popular articles was "Stopping by the woods on a Sunday morning" in 1930 which was reprinted again in Indian Express on this birthday in 1984. He penned several books as well, the most prominent of them being "The Book of Indian Birds" in 1941, which was inspired by Whistler's "Popular Handbook of Birds". It was later translated into several languages and saw more than 12 editions. However, his masterpiece was the 10 volume "Handbook of the Birds of India & Pakistan", written along with Dillon Ripley and was often known as "The Handbook". The first edition began in 1964 and was completed in 1974. The second edition came from contributions by J.S. Serrao of BNHS, Bruce Beehler, Michel Desfayes, and Pamela Rasmussen. This was completed after Ali's death. Besides the national and international bird books, Ali also authored several regional field guides, like "The Birds of Kerala" (first edition was titled "The Birds of Travancore and cochin" in 1953), "The Birds of Sikkim", "The Birds of Kutch" (later renamed as "The Birds of Gujarat"), "Indian Hill Birds", "Field Guide to the Birds of Eastern Himalayas". He penned his autobiography "The Fall of a Sparrow" in 1985 where he included his vision for BNHS and the importance of conservation related activities. One of his last students, Tara Gandhi, published a two-volume compilation of his shorter letters and writings in 2007. On his return from Burma, Salim Ali was married off to his distant relative, Tehmina, in December 1918 in Bombay. She accompanied him to all his expeditions and surveys. But his life came to a halt when she suddenly died following a minor surgery in 1939. Ali then started living with his sister Kamoo and brother-in-law. Salim Ali was honored and credited with several honorary doctorates and awards during his lifetime, though this journey began late. Starting with "Joy Gobinda Law Gold Medal" in 1953 by the Asiatic Society of Bengal, he went on to receive numerous accolades. It was based on the appreciation he received from Sunder Lal Hora. Thus, in 1970, he was conferred upon with the Sunder Lal Hora Memorial Medal of the Indian National Science Academy. He was bestowed with honorary doctorate degrees from Aligarh Muslim University in 1958, Delhi University in 1973, and Andhra University in 1978. On receiving the Gold Medal from the British Ornithologists' Union in 1967, Salim Ali became the first non-British citizen to be bequeathed with such an honor. He received the John C. Philips Memorial Medal of the International Union for Conservation of Nature and Natural Resources in the same year. In 1973, he received the Pavlovsky Centenary Memorial Medal from the USSR Academy of Medical Science and was made the Commander of the Netherlands Order of the Golden Ark by Prince Bernhard of Netherlands. He was honored with Padma Bhushan Award in 1958 and Padma Vibhushan Award in 1976. The Government of India established the Salim Ali Center for Ornithology and Natural History (SACON) in Coimbatore in 1990. Further, Salim Ali School of Ecology and Environmental Sciences has been established by Pondicherry University. The Salim Ali Bird Sanctuary in Goa and Thattakad Bird Sanctuary near Vembanad, Kerala have been set up in his honor. The place where BNHS was located in Bombay was renamed as "Dr Salim Ali Chowk". 1941: Wrote first book "The Book of Indian Birds"
1985: Penned autobiography "The Fall of a Sparrow"